Montenegro, Albania, Norway, and Ukraine have aligned themselves with the decision of the Council of the European Union to extend the economic sanctions against Russia. "The decision of the Council of the European Union extends restrictive measures for six months, until July 31, 2019. 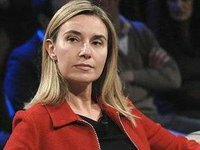 The candidate countries Montenegro and Albania, the EFTA country Norway, member of the European Economic Area, as well as Ukraine align themselves with this council decision," High Representative of the European Union for Foreign Affairs and Security Policy Federica Mogherini has said in a statement on Wednesday. According to the statement, four countries undertake to ensure compliance of domestic policies with the decision of the Council of the European Union. "The European Union takes note of this commitment and welcomes it," Mogherini said in the statement.